Watch blue sky nine this Saturday! 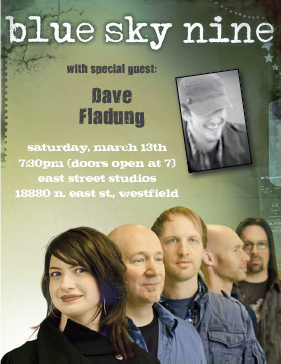 blue sky nine will be performing on Saturday, 3/13/2010 at 7:30pm eastern, and you can participate online! Liesl and I will be busy at other places, but hopefully you will be available. This entry was posted in Online Resources on March 9, 2010 by Karl.